Why Can't the Maids' Fingers Sparkle too? The universe is telling me I need to have one of these rings. I came across a round engagement ring with a smattering of diamonds the other day. Don't worry, it was just an image of one, not an actual diamond ring laying in the street that I happened to stumble (literally) upon. That image got me thinking how it'd be cool to make jewelry. Especially a ring that had a round setting that was filled with smashed pieces of colored glass. THEN I saw these. It was like Jenni herself read my thoughts and then one upped them. 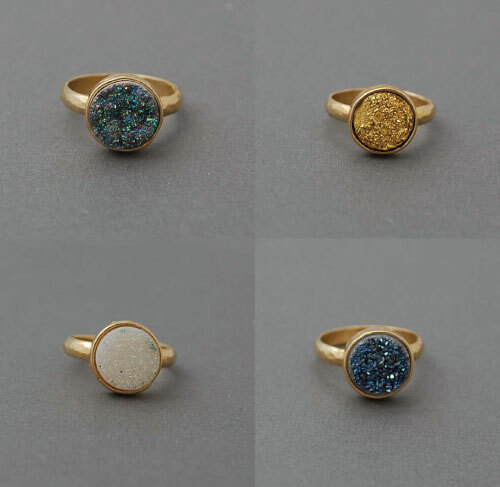 I'm usually not a fan of one-uppers, but when it's a circumstance that produces sparkly rings that are (somewhat) in my price range...I can over look. Where am I going with all this? Bridesmaid's gifts of course! If your besties/amigas/peeps/maids aren't "ring people" oooor you don't like them enough to spend 50 + per girl, there are some reasonably priced neck candy as well. 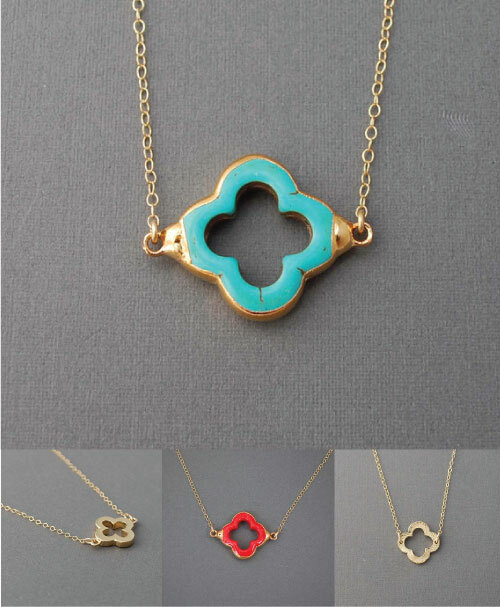 My favorites were the quatrefoils, but if I were a greedy girl, I'd want everything on the site. Shoot. Could you tell I played favorites with the turquoise? Alison and Dave's Save the Dates arrived! Ok they've been here for awhile, but I﻿'m just now getting back in the swing of posting. TOOT TOOT TOOT TOOT. Oh sorry, but that's the sound of my own horn. I can't help but think these suckers turned out pretty stinkin cute. Excuse the over exposed photoshopping, my computer is in need of some serious calibration. Or maybe it just needs a vacation. I left my hear in San Francisco. Ok, not really. 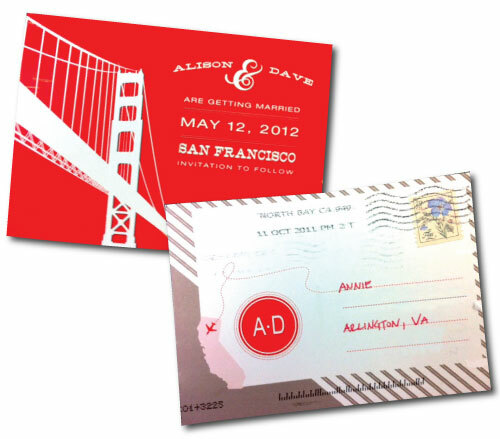 But my friend Alison, who happens to live in San Fran, is getting married next May! It seemed like an appropriate title. 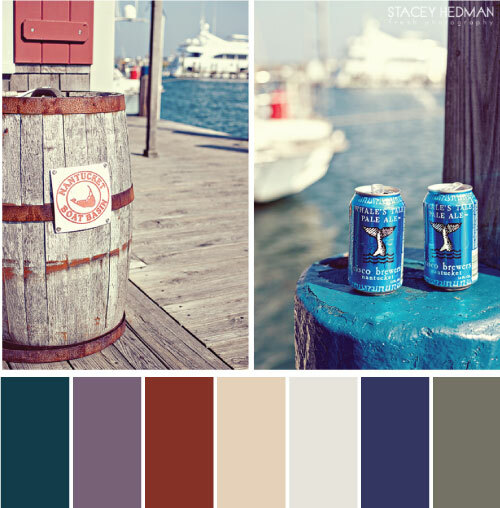 I'm excited to start doing Paired postings with her color way, but to kick start it, I thought I'd do a mood board. She sent me the images of the white lace, red and pink dresses below to communicate her color ways. Add in some warm grays, and wha-LA. Is it too obvious to state, the pop color was inspired by that little bridge they have over there? 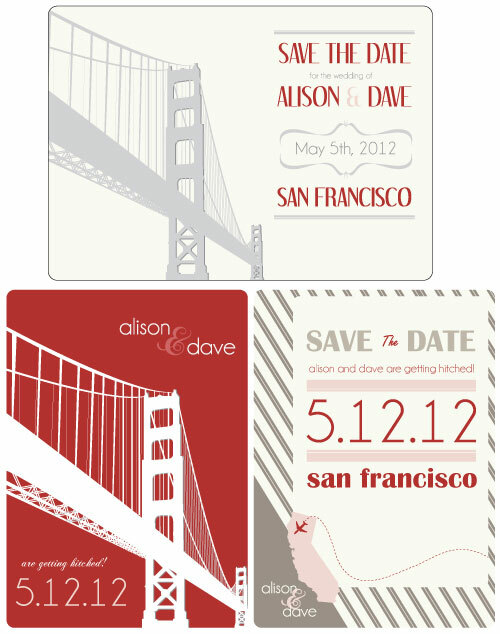 Just for fun I thought I'd try my hand at some save the dates incorporating their colors and inspiration. The only place (I can recall) that I've been apple picking around D.C. is Homestead Farms. They have a mean pumpkin patch as well. Bring on the hot apple cider. Disclaimer: No idea if you can actually rent out the farm, but a girl can have an active imagination, can't she? This wedding has been floating around the blogs. 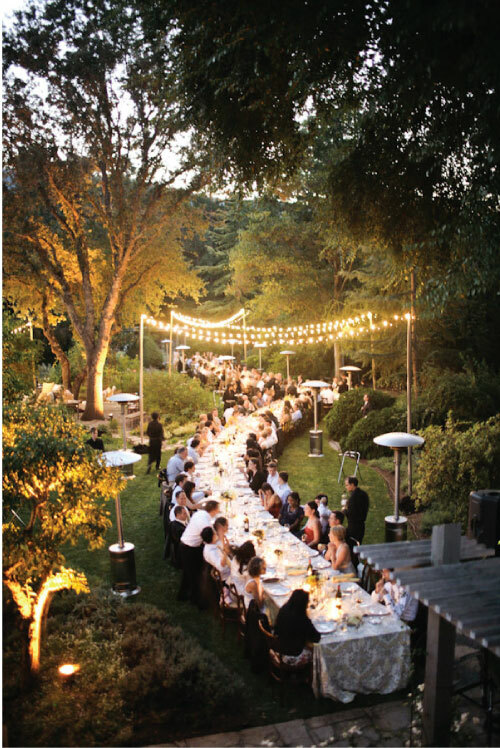 How much fun would it be to have a ridiculously long table beneath twinkle lights winding along the orchard? A lot. That trio of flowers is meant to be a broach, but it'd be fun to stick in your Maids' hair. It a gentle way that is. I can not deny my love for Emmerson's life. 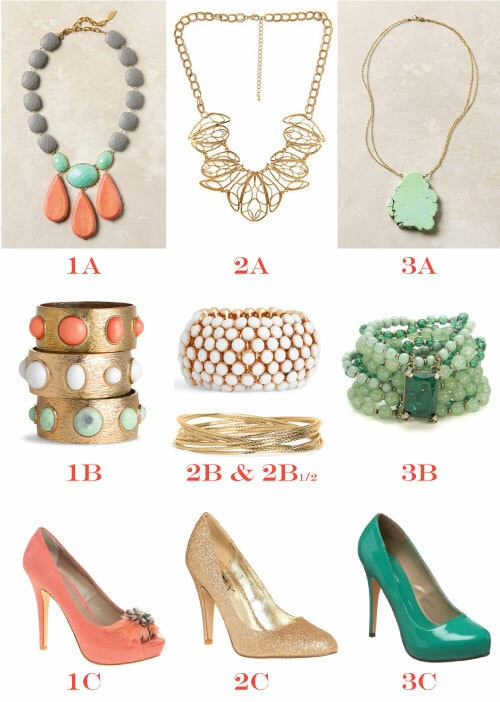 Her little clutches would make for a fun bridesmaids gift. Cliche to wear red in an apple orchard? Psh. I might have to buy that striped dress. Can't you see it with a blue belt and sandals for the 4th of July? I'm just sayin. 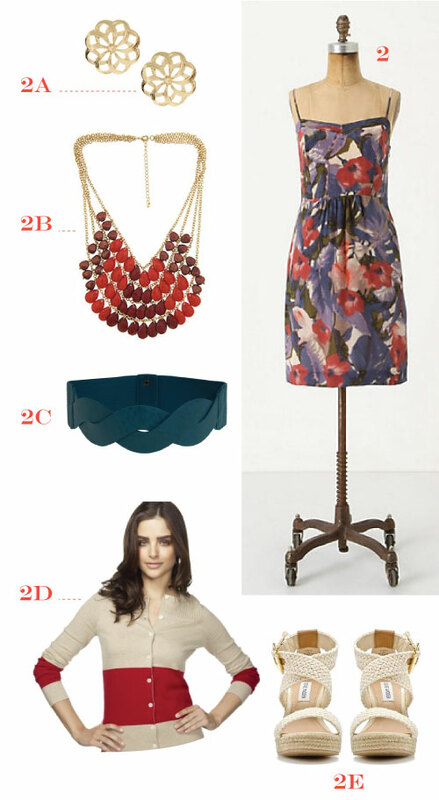 But lets be real, I'd wear that dress every day of the week if I could, not just at a wedding or on the 4th. Anyone else think the bride in that picture could be a little happier? Yikes. 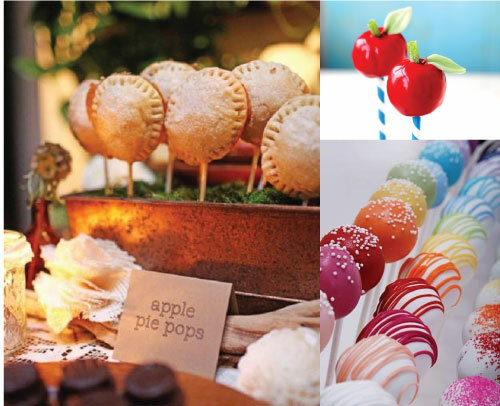 I think pie pops are going to be the next big thing. Anyone? Anyone? And they all lived apple picking and finger lickingly happily ever after. P.S. All the exact links can be found on my Pinterest Board "Apple Orchard." 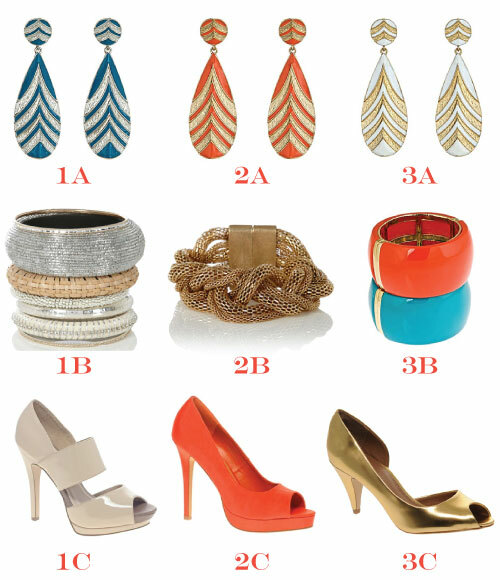 Fun way to spice up the maids' outfit, "matching shoes" technically, but love the idea of the multi-colored shoe party. My friend, Carrie, is headed to a wedding up in Nantucket in the near future. 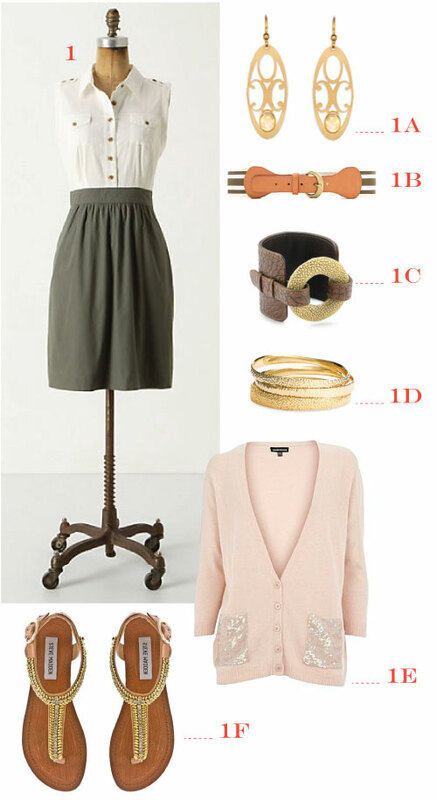 Upon her request, I decided to put a few outfit pairing together inspired by the seaside town. Apparently I was on an olive kick, who knew? I may have cheated a bit as well though. Only in the way that she told me she was thinking about buying option 1's dress. Might as well have a jumping block! I hate to admit it, but seriously J.Crew knows what they are doing. 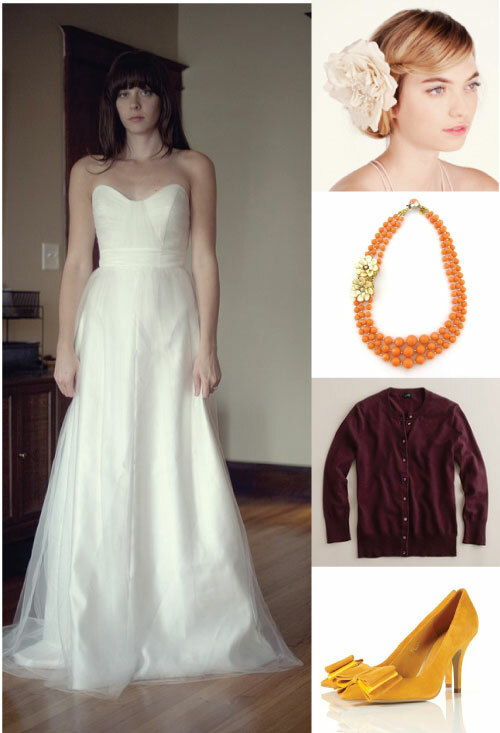 While on their site the other day (sale section, of course) I noticed they had a fall wedding preview up. From the photography to the colors and styles, let's face it, they nailed it. Hello little red dress, thank you for being something I could wear again after the wedding. Although I'm not the biggest fan of long bridesmaids dresses, I can't resist magenta and navy. 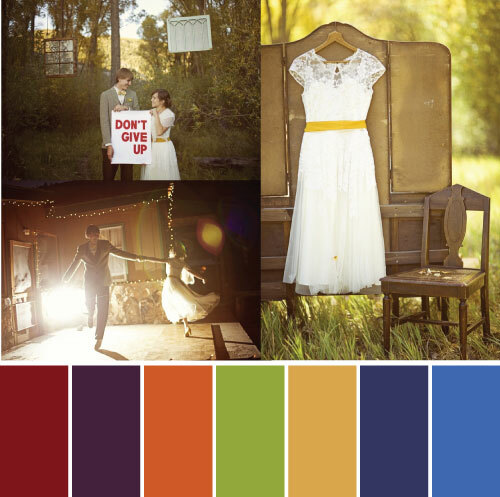 So, I decided to have a little fun with the color palettes. Oh, how I love color. Well done J.Crew, well done. And the brightly adorned maids, frolicked in their fall weddings and lived happily ever after. Alternative wedding rings/bands have been going around the blogging block these days. Why leave all the love and hearts to the bride and groom though? Or mainly the bride, I don't really see a lot of grooms running around sporting bands with hearts engraved all over them. (More power to ya if you ARE that groom who's an exception to the rule!) I may have a slight obsession with the hearts (As Februrary's I Heart Hearts might have given away!) 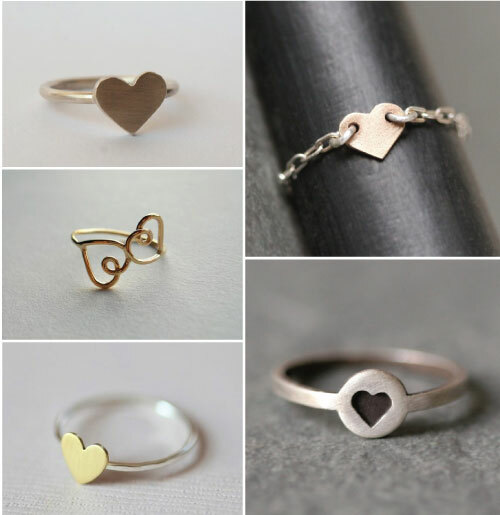 but why not show your bridesmaids how much you "heart" them with one of these rings. Hello cutesy bridesmaid gift.